The global automotive valves market is envisioned to gain largely from extensive research and development conducted by auto manufacturers and original equipment manufacturers (OEMs) to improve fuel economies and reduce fuel emission levels. The mounting regulatory and economic pressure is compelling OEMs to develop novel components that could produce bettered results compared to those offered by current components. The demand for high temperature resistance and high strength automotive valves is expected to surge in future with the downsizing of automotive engines enhanced with high power requirements. Buyers of the report offered herewith could be equipped with a dependable tool to analyze the crucial areas of the global automotive valves market and gain a complete understanding of its future situations. The analysts provide critical information about vital factors such as market size, future projections, trends and opportunities, competition, and growth drivers and restraints. 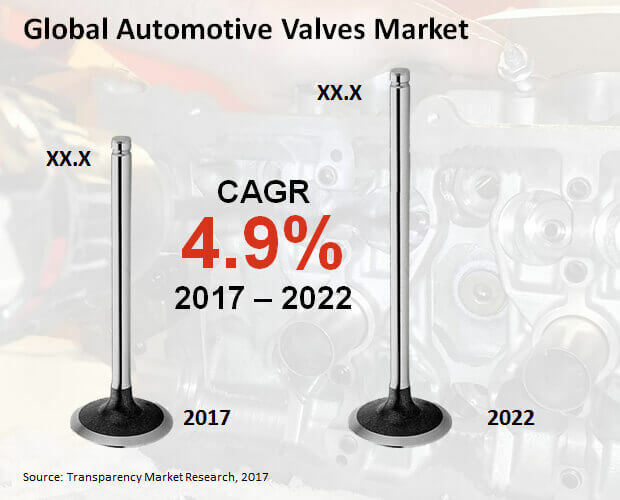 The world automotive valves market is envisaged to be boosted by the rapid rise in automobile sales across major regions. Countries such as India and China are witnessing a surge in the growth of automobile sales and production warranting a positive impact on the progress of the market. Heavy penalties imposed by authorities such as Corporate Average Fuel Economy (CAFE) and Environmental Protection Agency (EPA) upon failure to adhere to emission standards could bode well for the market. New automotive valve technologies, as a result, could receive investments directed by automakers. The market for supportable automotive valves is projected to be advantaged in the coming years due to the increasing upgrade of automobiles and incessant rise in automobile demand. The international automotive valves market is prophesied to see a product segmentation into AT control valve, water valve, tire valve, exhaust gas recirculation valve, solenoid valve, fuel system valve, thermostat valve, brake valve, air conditioning (A/C) valve, and engine (inlet and outlet) valve. By 2022, engine (inlet and outlet) valve could achieve a larger revenue of US$6.1 bn. By vehicle, plug-in hybrid electric vehicles (PHEVs), hybrid electric vehicles (HEVs), battery electric vehicles (BEVs), heavy commercial vehicles (HCVs), light commercial vehicles (LCVs), luxury passenger cars, premium passenger cars, mid-size passenger cars, and compact passenger cars are anticipated to divide the international automotive valves market. By sales channel, OEM and aftermarket could be the two chief segments for the international automotive valves market. By function, the international automotive valves market is predicted to be segregated into electric, pneumatic, hydraulic, and mechanical and pilot-operated. By geography, Japan, the Middle East and Africa (MEA), North America, Asia Pacific except Japan (APEJ), Latin America, and Europe could be key segments of the international automotive valves market. The analysts authoring the report on the worldwide automotive valves market study some of the vital industry players. Readers could gain important knowledge about companies such as Continental AG, Delphi Automotive, Hitachi Ltd., Denso Corporation, Federal-Mogul LLC, Eaton, FTE Automotive, MAHLE GmbH, FUJI OOZX, Inc., and Knorr Bremse AG.